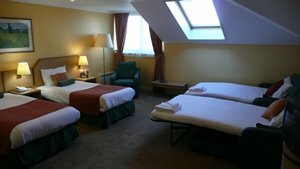 Spacious room, good service, adequate parking for 15 days included in the price, convenient drop off and pick up area's. 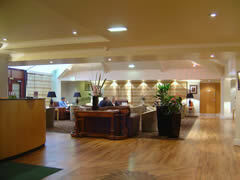 Very nice Holiday Inn. They had no notification of a booking for us although we had booked the room through yourselves. After a bit of a delay they found us an upgraded room which was great. Enjoyed a good night's sleep and at 4 o' clock in the morning we enjoyed a hearty continental breakfast before being taken over to the terminal by the shuttle bus. All in all a very good stay apart from the initial booking hiccup. Good value for money. Parking and one overnight at reasonable cost. Staff always courteous and helpful. Rooms always clean and comfortable. Will definitely use again. 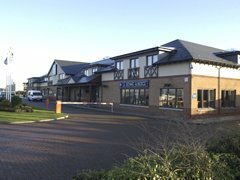 Very nice comfortable hotel with car park in hotel grounds. Coach transfers ran on time every 10 minutes. Will definitely use this hotel again. 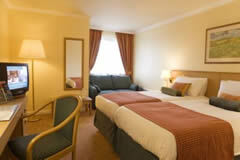 Rooms are very nice and clean , restaurant has a wide menu and breakfast was good . Car parking is secure and would use facility again. The biggest issue was our booking was with quality hotel and this had been taken over by holiday express and no one told us. We went round in circles for a while until someone told us the name had changed. An email to explain this would have been good!! Lovely hotel we only stayed 1 night but fab. Friendly staff. Room clean. Bed comfortable. Services good. Would stay there again. Parking facilities excellent.